Diabetics don’t have it easy. Not being able to eat sugar, chocolate, biscuits or other delicious sweet treats is a really tough challenge. Here’s a sugar-free Victoria sponge recipe dedicated to any diabetic readers out there…you deserve some ‘yum’ too! One 7 inch cake will give you eight slices. Line the bases of two 7inch cake tins and grease the sides with vegetable oil. Stir in the Splenda, the ground rice and the dried milk. Add the eggs, oil, milk with water, vanilla extract and salt. Mix with a wooden spoon or electric mixer. The mixture should drop off the spoon, if not, add more water. 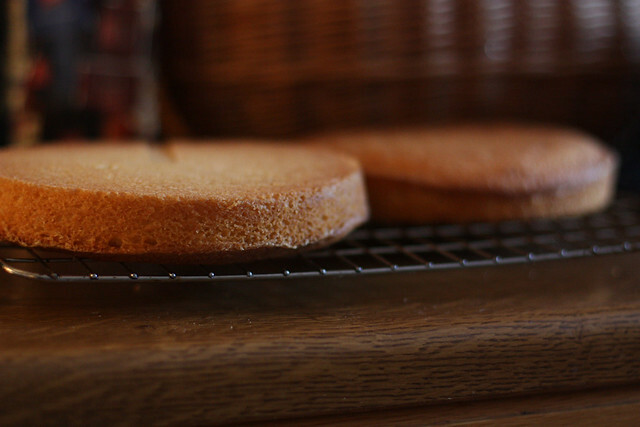 Spread into the two tins, level the tops with a spoon or knife then bake your cake for around 25 minutes. Allow to cool then turn out onto a wire rack. Once cooled, spread whipped cream onto the bottom of one half and strawberry jam onto the bottom of the other, then sandwich together. For more delicious diabetes-friendly recipes, check out The Ultimate Book of Diabetic Cooking and The Guilt-free Gourmet: Indulgent recipes without sugar, wheat or dairy on Amazon. Posted on December 3, 2013 by Lynne. This entry was posted in Food and tagged Diabetic, Food, Kitchen, Recipe. Bookmark the permalink.